Sadly, when it all came down to it, I decided not to keep anything. I loved the two sweater tops in the middle – but one was dry clean only (totally not mom friendly) and the other was too itchy. The 5th item was a pretty simple purple v-neck which is why I didn’t photograph it. If you think I’m down on Stitch Fix after my second box … I’m not. It was still super fun to get a box of surprise clothes handpicked for me to try. I rarely get out shopping anymore and had we been moving into fall I probably would have kept one of the sweater tops. I’m thinking I’ll order another fix in September in hopes of finding something fabulous for my birthday in early October. I’ll share what I get then! 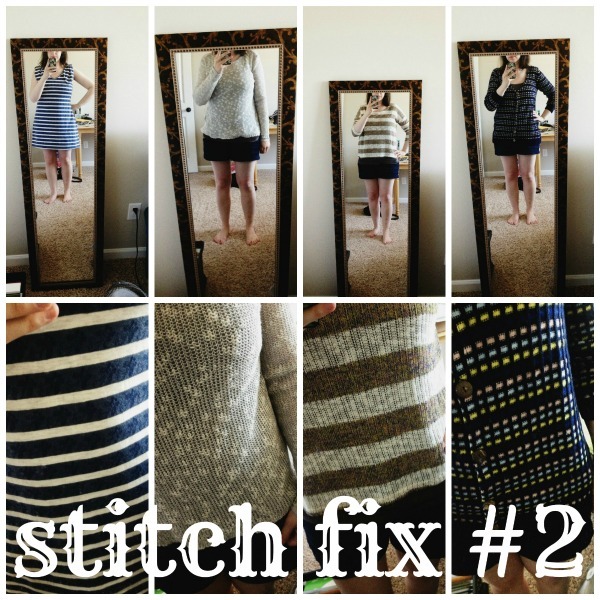 In the meantime, if you want to sign up for Stitch Fix you can here. I get a referral credit if you do which would be a lovely surprise to put towards my birthday fix! And, here’s photos of my first fix!